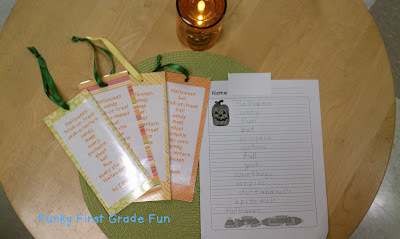 My students wrote line poems about Halloween this week. I'm super proud of how their writing turned out. First, we talked about the fact that their line poem should begin and end with the word "Halloween". Then they added 10 words in between that reminded them of Halloween. We published their writing by turning their poem into a fancy bookmark. When the bookmarks were complete, we did a poetry reading for our publishing celebration. All of the children sat in a circle. I brought jack-o-lantern light up candle to put in the middle of the circle. All those little poets sitting in a circle reading their poems by the light of a festive candle was just about the cutest darn thing! 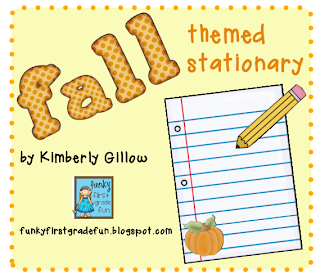 The paper we used is from my fall themed stationary pack. Today, they will take home their published piece (on the bookmark), the draft in their own writing and the memory of their first poetry reading! So cute! Love that they had a poetry reading and got to share! I love everything about this project! I just found your site (through a link from ClutterFreeClassroom) and am having a great time checking out some beautiful, useful ideas. I especially like your writing goals poster. Thanks for sharing!